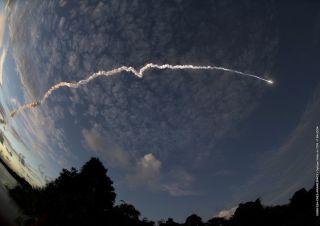 This dramatic image, taken from the Bois Diable (Devil Wood) lake at Kourou, shows the Ariane 5’s trajectory from the perspective of a fish-eye lens. The Feb. 12, 2009 night launch deployed the HOT BIRD 10, NSS-9 and Spirale payloads during a mission lasting just under 34 minutes. Beginning another busy yearof transporting satellites from Earth to space, the commercial Ariane 5 rocketsuccessfully launched two communications spacecraft and a pair of militarypayloads this evening. Thundering out of its SouthAmerican launch base at 2209 GMT (5:09 p.m. EST), the heavy-lift booster turnedeast and set sail on a half-hour ascent to its appointed geosynchronoustransfer orbit. Continuing its string ofconsecutive successes over the past six years, the rocket first deployed HotBird 10, a powerful new direct-to-home TV satellite for Europe, then releasedthe NSS 9 telecommunications spacecraft to bridge the Pacific and later ejectedtwo missile-warning micro-sats for the French military. "I'm absolutelydelighted to be able to share with you this new success," said Jean-YvesLe Gall, chairman and CEO of Arianespace. "This success goes to show thatAriane 5 ECA, which is a combination of power and dependability, is capable of29 successful launches in a row." Paris-basedsatellite operator Eutelsat plans to temporarily park Hot Bird 10 ingeostationary orbit at 7 degrees West longitude where it will replace thedecade-old Atlantic Bird 4 spacecraft for broadcasting TV programs to theMiddle East. Eventually, Hot Bird 10will be moved to its intended position at 13 degrees East longitude, joiningidentical sister-satellites Hot Birds 8 and 9 to beam nearly 1,100 television channelsand 600 radio stations to 120 million homes across Europe, North Africa and theMiddle East. The advanced spacecraft have increased the number of digital andhigh-definition TV offerings. "Hot Bird 10 is beinglaunched well before the start of its commercial mission at 13 degrees East,and that's why we decided that in the meantime it will contribute to ourexpansion into immerging orbital slots for television distribution," saidRaphael Mussalian, the satellite's mission director. Built by EADS Astrium usingthe Eurostar E3000 platform, Hot Bird 10 is equipped with 64 Ku-bandtransponders for relaying transmissions directly to small dishes at users'homes. Once Hot Bird 10 entersservice at 13 degrees East in about 18 months, it will free up the HotBird 6 spacecraft for future redeployment elsewhere in Eutelsat's expansiveconstellation. The new NSS 9 satellitewill operate 22,300 miles above the equatorial Pacific Ocean at 177 degreesWest longitude to connect communications between Asia and North America forgovernment, commercial and maritime customers. "Fromthis location, New Skies 9 will provide connectivity between all of the majorPacific Rim locations, as well as the west coast of the United States,"said Robert Bednarek, president and CEO of SES New Skies and SES AMERICOM. The all C-band spacecraftwill support telecommunications services with beams covering Australia,Indonesia, the Philippines, Japan, China, Korea and the Pacific Islands, plusHawaii and the U.S. mainland. "New Skies 9 will bewell positioned to serve customers in the government, telecom and media sectorssupporting applications as diverse as voice, internet trunking, videodistribution, along with a range of other communications services,"Bednarek said. Operator SES New Skies ofThe Hague, The Netherlands bought the new craft, which is built around asmaller satellite design, from Orbital Sciences to replace its NSS 5 bird thatwas launched more than 11 years ago. "New Skies 9 is thefirst satellite in a series of three to be launched in 2009 as part of asignificant fleet expansion program designed to extend our current services andbring additional capacity for the growth of our customers throughout theworld," Bednarek added. Hitching a ride into spacewith Hot Bird 10 and NSS 9 were the tiny SPIRALE micro-satellites for theFrench military. These two trailblazercraft, known as SPIRALE A and SPIRALE B, will test a space-based optical earlywarning system to detect enemy missile launches. The name comes from the Frenchacronym for "Preparatory System for IR Early Warning." Flying in a highlyelliptical orbit of 22,300 by 375 miles, the cube-shaped micro-sats will takeinfrared imagery to spot ballistic missiles during their boost phase of flight. A future operationalprogram could serve security and proliferation monitoring roles. "With the earlywarning system, France is taking a major step forward enabling it to assess, asa sovereign state, the nature and reality of ballistic threats and possibleattacks," said Patrick Auroy of the French Defense Procurement Agency. Today's launch of theworkhorse Ariane 5 was the rocket's first of perhaps sixto eight missions in 2009. Next up will be ArianespaceFlight 188 on April 16 to dispatch a pair of scientific spacecraft for theEuropean Space Agency. The Herschel infrared space telescope will probe theformation of stars and galaxies and the Planck observatory will look for theleftover radiation from the Big Bang that started the Universe. Both satellites were headedto the Ariane launch base this week to begin final pre-flight preparations.